IsoAcoustics ISO-L8R155 monitor stands will juice your monitoring accuracy. Enjoy tighter, more extended bass and solid stereo imaging – without shelling out for new monitors! IsoAcoustics has built the ISO-L8R155 according to the “PIF” (Placement, Isolation, Focus) principles of acoustic design. The results are immediately noticeable, and dramatic. Placed on ISO-L8R155 speaker stands – decoupled from supporting surfaces, with minimized reflections from nearby surfaces, and crystal-clear focus. Your old studio monitors will stun you with how accurate they are. 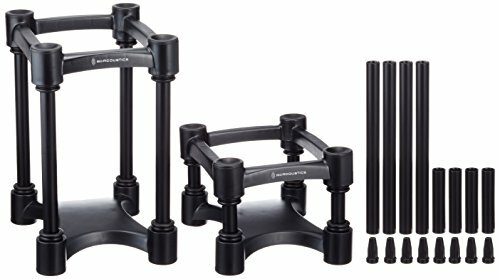 Get better monitoring (without getting new monitors) with IsoAcoustics ISO-L8R155 monitor stands.